Our VERY private vacation rental cabins offer a perfect family reunion location. Hunting clubs and large groups are welcome. Each of our log cabins is unique, with completely different settings and decor. All cottages feature covered front porches and screened back porches. We designed each of our vacation rental cabins to be roomy enough for a church retreat or a hiking club meeting yet cozy and private enough for romantic couples on a honeymoon or anniversary. Look inside this favorite Buffalo River vacation cabin rental now. Outdoor recreation fans love our Conner Homestead. Nestled in green Ozark forest trees, it sleeps up to 12. This roomy cabin is named for Pat's family who originally settled along Arkansas' near-by White River, famous for canoeing and fishing adventures. "We could have looked the world over and never have found a better place to stay." family log cabin rental here. "The cabin has so much character and charm. . .Your attention to detail is apparent. . . The decor is so cozy." for a family reunion vacation. Designed for parties and reunions and all kinds of fun, our Ferguson Homestead sleeps up to 12. Named for Libby's own family. They've lived in this little corner of Buffalo River country heaven called Bear Creek Valley for three generations since her grandparents settled here in the 1860's. "What a wonderful place for our little family retreat. Pleasant surprises throughout the cabin and grounds..."
We can accomodate groups up to 44 with plenty of outdoor activities to keep all ages busy. We specialize in private parties and family reunions. We also welcome business professionals workshops and spiritual retreats. 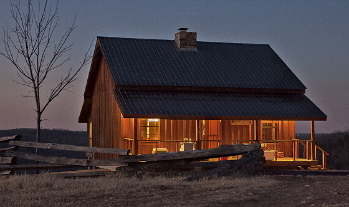 Check our Low Rates for your relaxing Arkansas log cabin vacation. Each of our vacation rental cabins comes with all these features: Cozy Stone Fireplace, Screened Porch, Dish Network Satellite TV and DVD for watching Movies, Complete Kitchen, all Linens, Charcoal Grill, over 1200 acres to roam and WONDERFUL VIEWS for your complete lodging comfort. Contact Us for Buffalo River cabin rental reservations now. Secluded outdoor paradise with 22 acres of water and ONLY 1 CABIN. Beautiful lake rental cabin provides lake lodging at it's finest.